Do you remember as a kid in the playground, climbing to the top of a slide and looking down to the bottom, thinking how high up you were? Well, standing at the top of any of the near-vertical vineyards in Portugal’s Douro Valley is a similar sensation! The Douro Valley runs west to east, 70km inland from the coastal city of Porto, and sits along the winding Douro River. The scenery in the valley is some of the most spectacular I’ve ever seen in a wine region. Not only because of the precipitous nature of the vineyards, which are striking in their own right, but also as you stand on the top of a vineyard and look around, you see a kaleidoscope of shades of green much like tiles of quilt, made up of individual plots of vines, olive trees and shrubbery, all tied together by the meandering jade coloured river. It is from these vineyards that some excellent red table wines are produced along with one of the world’s most revered wines, Port, for which the region is renowned. The Douro Valley is one of Europe’s oldest demarcated wine regions, meaning there have been regulations in place for over 300 years to protect the styles of wine produced there. It was back in 1756 that the Marquis de Pombal, then Prime Minister, instituted a sequence of actions to standarize the sales of Port, and amongst many of the things he did, was restrict the area within which the grapes planted for Port production could be grown. There are three distinct regions within the demarcated area of the Douro Valley and we visited all three on a recent trip. Every quinta (farm) that produces port, or dry table wines, must be located within one of the 21 municipalities within these three areas. As I tried not to get car sick as we wound our way along narrow mountain roads and around stomach-churning hair-pin curves, we discovered that each of the 3 areas produce wines of different styles. The vineyards in Baixo (by-sho) Corgo receive the most rainfall and therefore produce a lighter style of wine with less ageing potential that are used mainly for cost-effective, entry level ruby ports. As I tried not to get car sick as we wound our way along narrow mountain roads and around stomach-churning hair-pin curves, we discovered that each of the 3 areas produce wines of different styles. The vineyards in Baixo (by-sho) Corgo receive the most rainfall and therefore produce a lighter style of wine with less ageing potential that are used mainly for cost-effective, entry level ruby ports. In the middle of the valley lies the Cima (see-ma) Corgo. A few of the wines produced here will become dry wine, but most are used for some of the region’s best ports, including Late Bottled Vintages and many of the premium vintage ports. The Douro Superior, on the very eastern end of the valley, close to the Spanish border, has numerous vineyards whose grapes are destined for port, but its main claim to fame is it produces the best dry wines of the trio. As you can imagine, harvesting these extremely steep vineyards is not easy. Historically, when the vineyards were first planted, two or three rows were grown horizontally across the hillside on terraces. These were similar to large steps carved into the hillsides and built with the support of high brick walls. This worked well enough, but the vineyards had to be harvested by hand as they were too narrow for a tractor to pass between them. Terraced vineyards still exist, but these days you will also see two other types of vineyard orientation: ‘patamares’ and ‘up-and-down’. Patamares are the modern answer to terraces. The vines are still planted horizontally across the hill, but there are no more walls, instead the rows of vines are connected by sloping ramps which are wide enough for a tractor to drive through. The third style of vineyard you’ll see amongst the patchwork scenery, is the most common in other wine regions – the multiple rows or ‘up-and-down’ plantings. Tractors can rarely scale such heights, so these have to be harvested by hand by pickers who, while doing the back-breaking work, also have the added degree of difficulty of trying to keep their balance! We got out into the vineyards and tried our hand at picking grapes which was great fun for about the first 20 minutes, any longer and you start to wonder if you’ll ever be able to stand upright again! One piece of advice I’d offer if you ever go to the Douro Valley, (do it if you can!) – travel as often as possible by boat or train, instead of driving along the winding roads by car, not only because of the tasting you’ll be doing at the quintas you visit, but, because experiencing the landscape from these different vantage points is exhilarating and it will prevent you from turning as green as the river, like I did! A fact about the vineyards in the Douro, which I found interesting and that very few wine drinkers are aware of, is that they are classified by a rigorous rating system. The better the vineyard site, the better the rating, the better the perks for the winemakers. 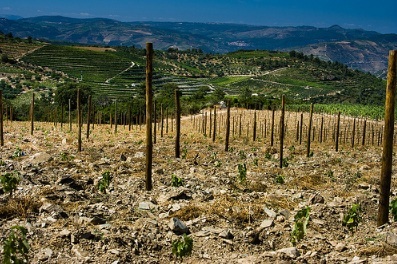 There are twelve features that are taken into account and points allotted, based on such elements as aspect, exposure to sunlight, soil density, gradient, age of vines – and according to Quinta do Tedo owner, Vincent Bouchard, the most important element in attaining a high rating is the vineyard location. So what are the benefits of having a good rating? The main one is that quintas with the highest scores are allowed to make more wine that those with a lesser grade which means they’ll have more to sell. Vineyards are given a score between A-F, and only about 2-2.5% of the vineyards have top ratings of A or B, the majority fall into the C and D categories. This doesn’t mean the wine are inferior, just that there’s not as much of it. We’ve talked a lot about the vineyards so far, so now let’s take a look at the grapes themselves. Incredibly there are over 90 varieties growing in the Douro and all of them are permitted for use in the port blend as stipulated by the Port and Douro Wine Institute (IVDP), which is charged with overseeing the modernized regulations set forth by the Marquis de Pombal. Through several series of tests over the years, five grape varieties have been recognized as the ones best suited to Port production (many of which you’ll also see on the labels of bottles of dry wine from Portugal). They are: Touriga Nacional, Touriga Franca, Tinta Roriz (Tempranillo in Spain), Tinto Cão and Tinta Barroca, but there are many others used including Sausão, Tinta Amarella and Tinta Carvalha. Historically vineyards were planted with a mixture of varieties all growing in amongst each other, to the point where even the growers weren’t sure exactly which ones they had on their land! This is still the case today and such vineyards are known as ‘field blends’. We picked grapes in a field blend and to our untrained eyes all the grapes looked the same – they were purple! But on closer inspection, the size of the berries varied slightly and when you crushed the grapes between your fingers and rubbed the skins together, some had dark, staining skins while others were juicy and pulpy with barely any colour at all. Many of the newer vineyards are planted with just one variety simply in order to ensure all the grapes reach maturity by harvest time, since not all grapes in a field blend are as ready to be harvested as others. One thing all the varieties grown in the Douro Valley have in common is their ability to withstand extremely warm temperatures. Summer in the Douro can see the mercury rise to over 40˚C for days at a time. Manuel de Novaes Cabral, President of the IVDP, describes the climate in the Douro as “9 months of winter and 3 months of hell!”. Even though we visited at the end of September when the weather is usually still very hot, we got an early dose of winter with windy, cool conditions and didn’t experience the savage summer heat. It is the unbearable high temperatures that compelled Port shippers in the 18th century to send the wines away from the Douro Valley to age. They wanted to avoid the roasted characters, known as the ‘Douro bake’, that are associated with wine matured in the oppressive heat. The spring after the harvest the wines were always shipped down to the coast and the town of Vila Nova de Gaia, which lies across the river from Porto near the Atlantic coast. ‘Gaia’, as it’s referred to, may be considered the spiritual home of Port. Even though no wine is actually made there, the city is intrinsically tied to the Douro Valley, not just by the winding thread of the river, but because up until a couple of decades ago, every bottle of port produced in the Douro Valley had to be exported from the city of Gaia. We walked around the town amongst some of the vast lodges (cellars) owned by the big port shippers like Taylor’s, Cockburns, Grahams, Ramos Pinto, Sandeman, enjoying views of the long, slender Rabelo boats that used to bring the wine from the valley down to Gaia, before trains took over. We paid a visit to Taylor’s and saw the hundreds upon hundreds of barrels of port of all shapes and sizes resting in Gaia’s moderate climate, which unlike the heat of the valley, is ideal for ageing these special wines. Until only a few decades ago, all the wine made in the Douro Valley had to be sold and shipped from Gaia, meaning many of the 32,500 winemakers had no choice but to sell their entire production to one of the big shippers who could afford to own a lodge in Gaia. Thankfully this restriction was lifted in 1986 and people like the fabulous, young, passionate Oscar Quevdeo can now ship his family’s wines directly from the Douro Valley, which is great for them and even better for us! 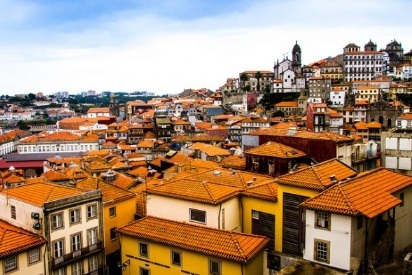 The Douro Valley and the cities of Porto and Vila Nova de Gaia are fascinating – dramatic and striking is the landscape, alive and enthusiastic is the passion of everyone involved with port production (and almost everyone is in one way or another!) and steeped in tradition yet contemporary and refined is the wine. There is great history and pride in every bottle of port and dry wine from the Douro Valley and whether you drink one in the steep vineyards or at home with friends, each one brings us a sense of pleasure in much the same way as slithering down that slide gave us as a kid.